(Bloomberg) – Mercedes-Benz, the world’s largest maker of luxury cars, is rolling out its first in a series of battery-powered models, adding to a growing array of high-end brands targeting Tesla Inc. 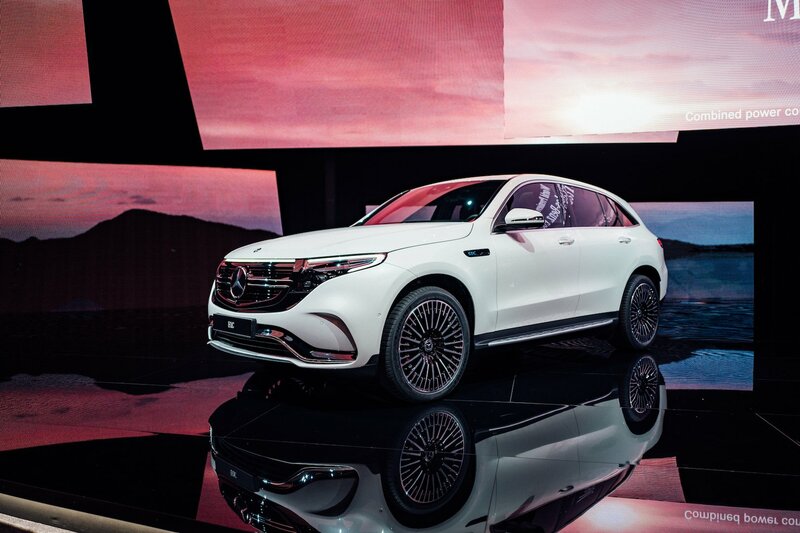 The Mercedes EQC crossover starts production in the first half of next year, part of a plan to develop its EQ electric line, Daimler AG Chief Executive Officer Dieter Zetsche told reporters in Stockholm at the car’s world premiere. The company intended to invest 10 billion euros ($12 billion) on the electric-car push, but the spending has become “more than that,” he said Tuesday, without specifying figures. The car joins the Porsche Taycan, Audi E-tron and Jaguar I-Pace in putting pressure on Tesla as the California-based carmaker struggles to ramp up the Model 3 and make a profit. Mercedes plans to assemble the EQC at its factory in Bremen, where the automaker also makes its best-selling C-Class sedan. Daimler will build the car in China for the local market. The EQC is set be profitable and will “offer the best package” compared to rivals, he said, declining to comment on pricing. The EQC is set be profitable and will “offer the best package” compared to rivals. Mercedes and other luxury brands are pushing aggressively into electric cars to challenge Tesla after its success in wooing wealthy buyers with the Model S. Including the Smart brand, which will abandon combustion engines in coming years, Daimler plans to offer 10 fully electric cars by 2022. To underscore the shift, Mercedes will spend 1 billion euros on battery production to create a network of eight facilities globally. As they encroach onto Tesla’s turf, traditional luxury manufacturers are trying to capture some of the pioneering electric carmaker’s techy glitz. Mercedes unveiled the EQC on the sidelines of the me Convention in Sweden, an event it co-sponsors with South By Southwest that is billed as “a tour of the future through the lens of tech, art and design.” Audi’s E-tron will be launched later this month in San Francisco, Tesla’s backyard and the heart of the tech community. Competition will be particularly fierce in the SUV and crossover categories. In addition to the Model X, which starts at about $85,000 before tax rebates, the rivals include the coming e-tron and Jaguar Land Rover’s well-received $70,000 I-Pace. The new EQC — roughly the size of the brand’s popular GLC SUV — features a range of more than 450 kilometers (280 miles) and accelerates to 100 kilometers per hour (62 mph) in as little as 5.1 seconds. The Model X has a range of 237 miles. Daimler doesn’t plan to establish a dedicated electric assembly plant and will instead build the vehicles at the same sites as conventional automobiles to be able to better adjust output, Zetsche said, adding that he expects demand to mainly eat into sales of combustion cars rather than lure new customers. Daimler shares fell 1.5 percent to 54.20 euros at the close of Frankfurt trading, extending declines for the year to 23 percent. In addition to responding to shifting consumer tastes, electric models are critical for carmakers to meet increasingly stringent emissions standards. Some countries like the U.K. and France are even planning to ban combustion engines in coming decades. Establishing electric cars would also help Daimler move beyond concerns over its diesel vehicles. Germany’s Transport Ministry forced the recall of 774,000 cars over allegations that they were equipped with questionable software that made them pollute more on the road than during test results. Even as he targets Tesla, Zetsche praised CEO Elon Musk for making electric cars popular. But Daimler has no plan to consider investing again in the company. “This isn’t a good point in time,” he said.